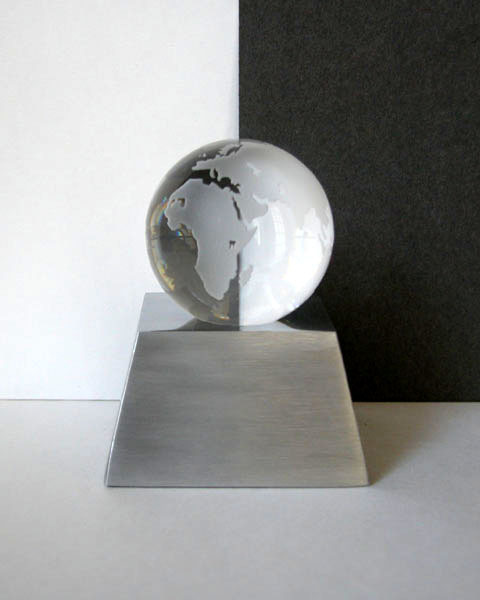 A photo of a crystal globe on a metal base taken using the illusion of refraction. This was my first challenge, so it was very much a learning experience! Great idea, a bit rough on the edges but very good. That's clever! I like the way the colours reverse inside the globe. I think I'd crop out some of the foreground though. An abstract feel. Nice texture throughout. You might have wanted to crop this a little closer. Just a bit grainy. Sharper focus would really do this pic justice. The tones aren't quite right for me. I;m expecting to see true black/white, but the colors seem muddy. There's also what appears to be noise/grain on the black part of the background. The whole image feels excessively soft fo me. But I do like the concept and your choice of models. Very nicely done! Suggestions would include working to reduce or eliminate the shadow on the right side of the stand, and to make your black background more completely black. Maybe should have zoomed in a little more. Or tried to get the 3 areas of white, grey, and black more equal in demensions. There seems to be some distortion on the white background. Great picture, though! I like how the black and white get reflected in the globe. Seems a little out of focus and grainy. Proudly hosted by Sargasso Networks. Current Server Time: 04/26/2019 07:42:10 AM EDT.